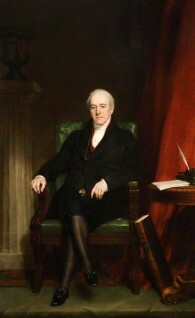 Martin Hopkinson opened this discussion by asking whether the portrait of Francis Const in the British Museum could have been painted by John Jackson. Andrea Kollmann instead wondered if the portrait was by H. W. Pickersgill, citing the description of Pickersgill’s portrait of F. Const from 1834 in a contemporary newspaper. The suggestion of Pickersgill as the correct attribution was further confirmed, as Kollmann found another description of the painting from the Public Ledger and Daily Advertiser newspapers. This description, once again, attributes the painting to H. W. Pickersgill, and interestingly mentions that the two volumes resting on the chair are inscribed with the words ‘State Trails’. Al Brown suggested that, evidenced by a section from The New Monthly Magazine of 1829, the painting could in fact be the work of Pegler. The idea was dismissed by Barbara Bryant, who claimed there is little in the way of stylistic similarity between Pegler’s other works and the portrait of Francis Const discussed. The final piece of evidence came when Middlesex Guildhall Art Collection provided a close-up image of the volumes mentioned in the Public Ledger Article, and it can be seen that they are inscribed with the words ‘State Trails’. The discussion ended with the painting attributed to Henry William, which was exhibited at the Royal Academy in 1834. Did John Jackson (1778–1831) paint Francis Const?